White Orchid is an IGT developed slot that comes with 5 reels and 40 paylines with 1,024 ways to win possessing a theme based on nature and the rainforest. The slot has quite a feminine style to it with white and pink being the prominent colours. The focus on the flowers and nature also give it a relaxing ambience that hopefully will not put male players off because there is more to this game than just stereotypical girly colours and theme. The regular symbols in the game consist of a Lady, Man, Hawk, Colourful Bird and a Fish. The Wild symbol is represented by the White Orchid Logo. It only appears on reels 2, 3, 4 and 5 with the ability to appear stacked with the potential for four Wilds to appear on a single reel. The Scatter symbol in White Orchid is represented by the White Orchid symbol and appears on reel 3. It can also appear stacked with up to four of the White Orchid Scatter symbol potentially appearing on the centre reel. It is also key to triggering the bonus feature in White Orchid. The White Falls Free Spins Bonus feature is triggered if you manage to hit two or more White Orchid Scatter symbols on the third reel. The number of free spins you will be awarded will depend on how many White Orchid Scatter symbols you hit on the third reel to trigger the bonus feature. 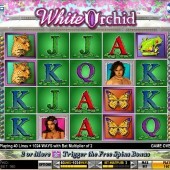 You can win up to 20 free spins if you trigger the bonus feature with four White Orchid Scatter symbols. The free spins can be re-triggered with you being able to win up to 130 free spins and be in with a chance of winning the jackpot of 250,000 credits. 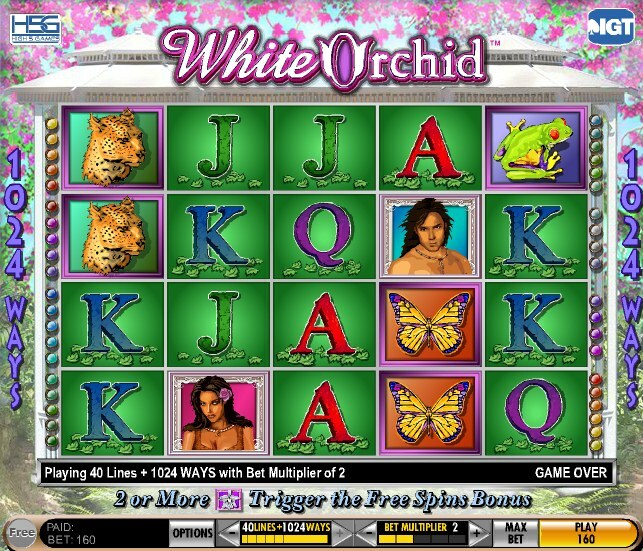 White Orchid began life as a land-based slot and fortunately it has transferred effectively to the online genre. The theme might not appeal to every player, more suited to fans of fellow IGT slots such as the cat themed Kitty Glitter slot or the mystical Diamond Queen slot, but it is worth putting first impressions to one side because there is a cool little game beneath the surface.